NxCore tape files are broken down into an easy to use data structure. The images below and on the following page graphically depict all the data fields available in NxCore's tape files. Nanex offers several packages that demonstrate coding with the NxCore API, from the most basic examples to the most advanced. For information on all the sample code packages we offer please visit our page "Coding in NxCore, A Developers Guide to the NxCore Sample Applications and Source Code Libraries". The tape files are sequential, and this means all the data is in the exact same order as it came from the exchanges. The data comes in the exact same way as it would in real time. The tapes are also compressed over 90%, allowing for more data to be packed into smaller files. This makes getting real time data for more exchanges possible. It also allows historical tapes to be downloaded quicker. Depending on the type of data you are interested in, NxCore has the following symbol types: equities, options, futures, future options, indexes, currencies, mutual funds, and bonds. A detailed list of all the exchanges and what is avalaible on each exchange can be found here. This overview is a general explanation of how the data is represented in NxCore tape files. It begins with an explanation of the fields in NxCore System. More specific information regarding the API can be found here. NxCore System contains all the information regarding time and status of the tape. nxDate holds the value for the tape's date. 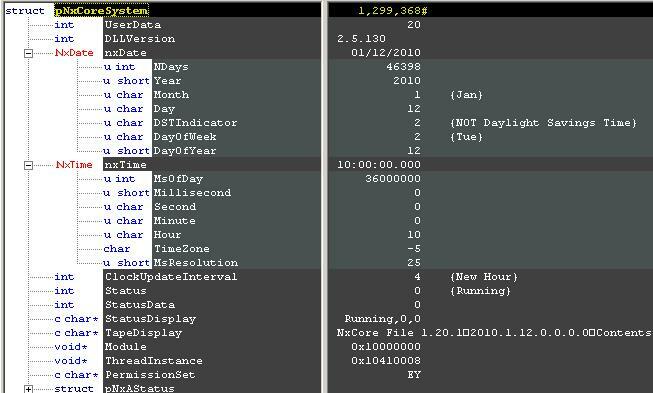 nxTime contains data regarding the time. While processing tape files this is the field that will allow the user to know what time of the day the tape is processing. While processing the tape the user can trigger events using the time. NxCore Messages contain three main fields: coreHeader, coreData, and MessageType. coreHeader contains the common fields required for all trading data. As you can see from the picture it includes the symbol, option data (if necessary) , listed and reporting exchange, and the date and time. These are fields that are required for all message types. The overview will go into further detail for each field. coreData holds all the different message types and their data. There are seven message types: Status (from pNxCoreSystem), Exchange Quotes, Trades, Market Maker Quotes, Categories, Symbol Change, and Symbol Spin. MessageType is a numerical representation of the size message types. It instructs the user to what type of message is being played at that moment in time. The next page will detail the NxCore messages and the data they contains.